Spoke about acknowledging the violence plaguing our community and the necessity to build a movement to stop it. Spoke about racial tension and ending the cycle of violence, to approximately 150 people. 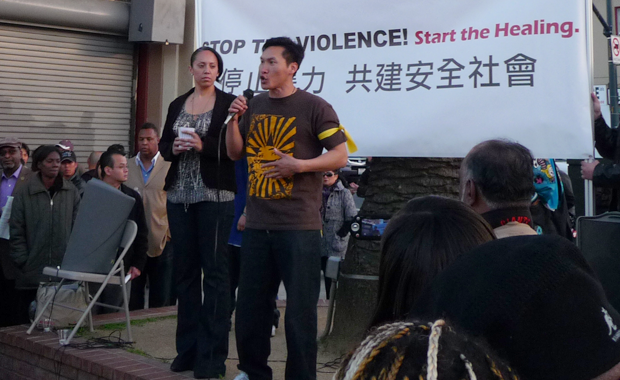 Chinese for Affirmative Action announced details of a Thursday, April 8, 6:30 p.m., community vigil to honor the life of Huan Chen, who passed away on March 19, and to raise awareness about the need to address violence and racial tension in Southeast San Francisco. Chen was attacked on March 22 on a light rail platform. The vigil is being organized by a group of community members – Sally Chan, Allison Chen, Linda Chu, Calvin Hom, Edward Hom, Sharon Hom, Norman Fong, Joe Huang, Michael Leung, Vincent Pan, Roger Tan, Michael Yip, Emily Yuen, Eddy Zheng – who met at the offices of Chinese for Affirmative Action to discuss the recent violence along the Third Street light rail in Southeast San Francisco on April 4th . The theme of the vigil is “Stop the Violence, Start the Healing” and will begin at 6:30 p.m. at 3rd Street and Palou Avenue. The organizers are inviting all members of all communities to participate. The organizers see the vigil as an important step in the community’s healing process and a way to demand that the recent violence stop.